The Pueblo Magico of Todos Santos is renowned for its annual art festival, which not only features creative work from talented local residents of the highly regarded artists’ colony, but also paintings, sculptures, jewelry and traditional crafts from some of Mexico and the international community’s most notable artists. 2013 marked the 16th year of the festival, originally founded to promote the richness of Mexican culture. In addition to the usual exhibition and sale of first-rate art, this year’s celebration showcased theater productions, traditional folk dancing, and outdoor musical performances and poetry, as well as generous samplings of food and drink from many of the area’s most respected bars and restaurants. If you didn’t make the 2013 celebration of the Todos Santos Art Festival, you’ll definitely want to attend in 2014, with a whole new collection of fine arts and crafts from around the world. For information about the best local accommodations, visit www.CalyCanto.com. 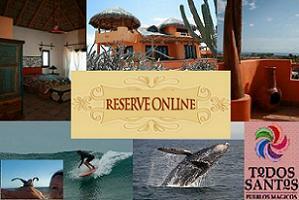 We look forward to sharing wine and cheese with you in Todos Santos!